Next Step is now offering video training courses of Amy Carroll’s teaching and curriculum for those who love to work at their own pace. These self-paced video courses are designed to stand alone for you to use on your own. They also can be reviewed as often as you choose. First, purchase the video courses (see prices and descriptions below) and use them on your own, working at your own pace. All videos are Amy Carroll’s teaching. Or you have a second option. If after buying your course you decide that you’d like to have coaching time with Amy to go with the course, you can click here to set up a free consultation call with her to get started. With no price penalty, you’ll simply pay the difference between the cost of your course and the coaching service. 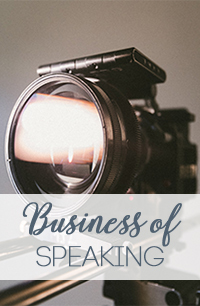 The videos and handouts included in the video courses are the same content used with her coaching clients; however, the video courses below do not include personalized coaching time with Amy. Mine scripture for a message with a firm foundation and the power to transform your audience. Create a compelling 30-45 minute written message rooted in your passion. Gather speaking tools based on proven methods that will allow you to write future messages with complete confidence. Note: A required copy of Communicating for a Change by Andy Stanley is needed to complete this course. Create a compelling list of values statements that give potential audience members a peek at what they’ll receive from your messages. Communicate your credentials and experience to event planners in a winsome and relevant way. Develop topic descriptions that excite ministry leaders and motivate people to attend your events. Gain a list of referrals for design professionals. Generate a list of “must haves” for your website including exciting ways to connect visually and with social media. Develop a plan for your website to help communicate your vision to web developers. Establish a timeline for excellent communication with event planners. Avoid the pitfalls of miscommunication by using personalized planning forms, contracts and invoices. Work through the process of creating your own fee schedule. *Note: Several of the services include a video about creating a tagline. To address this overlap between services, please contact me at [email protected] if you purchase multiple courses with this video. I will schedule 20 minutes of personal coaching for each “extra” time you receive the video about creating a tagline.